This article was originally published in the Fall 2013 issue of Household & Personal Care Wipes – a supplement to Happi magazine and Nonwovens Industry magazine. If we listen to consumers, they will tell us everything we need to know to create better packaging solutions. In the last year, Perimeter Brand Packaging has connected with over 10,000 consumers on a variety of topics, including a series of consumer insights studies focusing on personal care and beauty wipes. 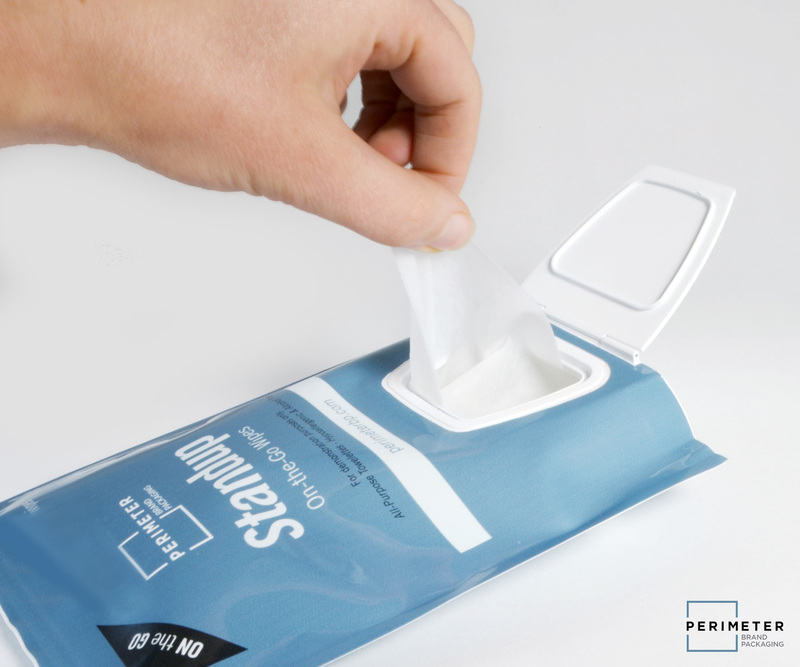 The research led to three unique wipes packaging solutions recently launched by Perimeter. This study centered on beauty wipes, because the wipes industry, although a mature market, is still growing annually. According to Euromonitor, the wipes market was estimated at $2.49 billion in 2012 and the industry is expected to grow to $2.92 billion by 2017. While the personal care market is dominated by baby wipes sales, the growth rate for personal care wipes (wipes for makeup removal, skin care, intimate care, etc.) is keeping pace. The personal care wipes market is expected to grow from $313 million in 2012 to $353 million by 2017. The consumers that participated in Perimeter Brand Packaging’s wipes study were female consumers who used wipes regularly for makeup removal and skin care, and used beauty wipes outside the home at least three times a week. Research participants were asked to bring beauty wipes they regularly use to each session for discussion. Perimeter found that the top three characteristics that consumers look for in beauty wipes packaging are the exact same three that they felt beauty wipes packaging was failing them. It’s not complicated, wet wipes should stay wet. Unfortunately, the classic problem with most wet wipe products is the dry-out. One after another, consumers pointed out that the number one problem with their beauty wipes, particularly with the stick-on flap closure, was that they dry out before they have finished using the product, which results in the need to throw unused product away. “My wipes dry out easier with [the sticky flap] top, because if you don’t stick it on exactly right air gets in there and they’re not as moist,” said another consumer. Many research participants admitted to resorting to tape to help keep their beauty wipes packaging closed. The consumers consistently felt that a hard plastic top was superior to maintaining moisture and preventing dry-out due to the audible click. It’s a well-established fact that consumers are on the move, constantly. Beauty wipes are being used about three times daily away from the home, often used in the car, gym/beach bag, and while traveling. The current packaging for beauty wipes is not conducive to consumers’ increasingly mobile lifestyle. 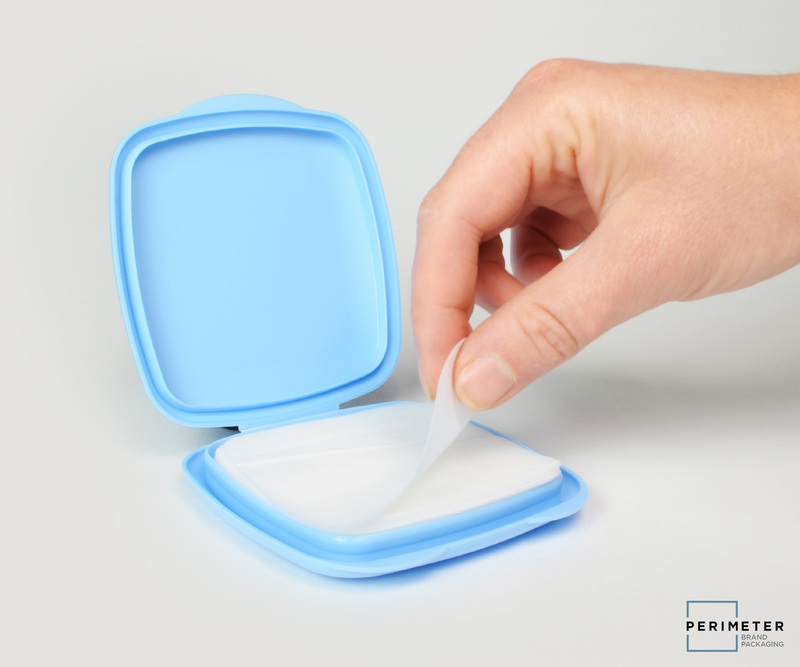 When asked about packaging for beauty wipes on the go, consumers are looking for packaging that is not only portable, but prevents waste, maintains moisture, and provides easy access to wipes. Consumers said that the sticky flap closure, seen on most beauty wipes packaging today, required too much attention to close properly while on the go, but also that debris from inside their purse or bag often prevented the sticky closure flap to seal properly. If it’s not properly secured it’s ruined. Beauty wipes are very expensive. Then I feel like I wasted it all,” said one consumer. Although many consumers prefer the functionality of the hard top versus the stick-on flap closure, for some the association of the packaging with the hard top was too similar to well-known baby wipes packaging and did not provide the experience they wanted when using cosmetic and skin care wipes. 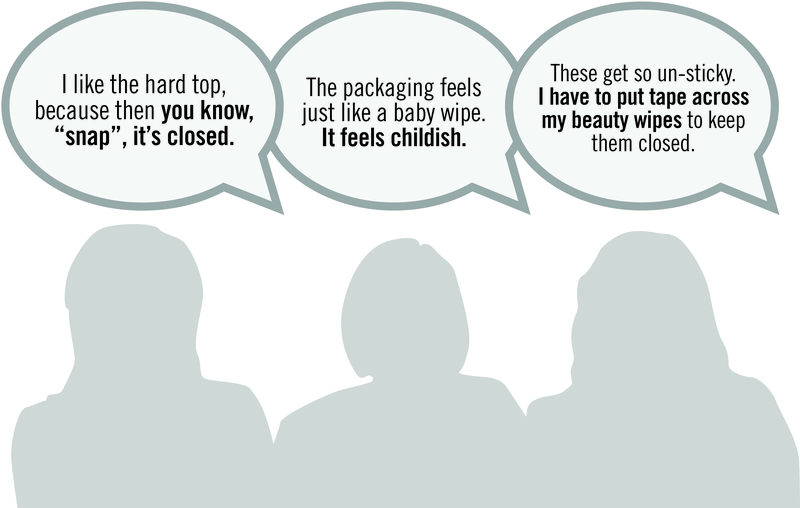 Other consumers felt that the current packaging for beauty wipes is not discreet for their on-the-go lifestyle because it looked like baby wipes, not cosmetic wipes. With the expected rise in popularity of flushable moist wipes for adults, and recent market introduction of feminine hygiene wipes and intimate care wipes, we can only expect the association of baby and flushable adult wipes versus cosmetic and facial care wipes packaging to become more solidified in the mind of the consumer. With current packaging offerings consumers are forced to choose if they would rather have the hard-top, which they feel better maintains moisture but makes them feel like they are using baby wipes, or the stick-on flap closure, which they feels dried out more quickly but feels like they are using a beauty wipe. 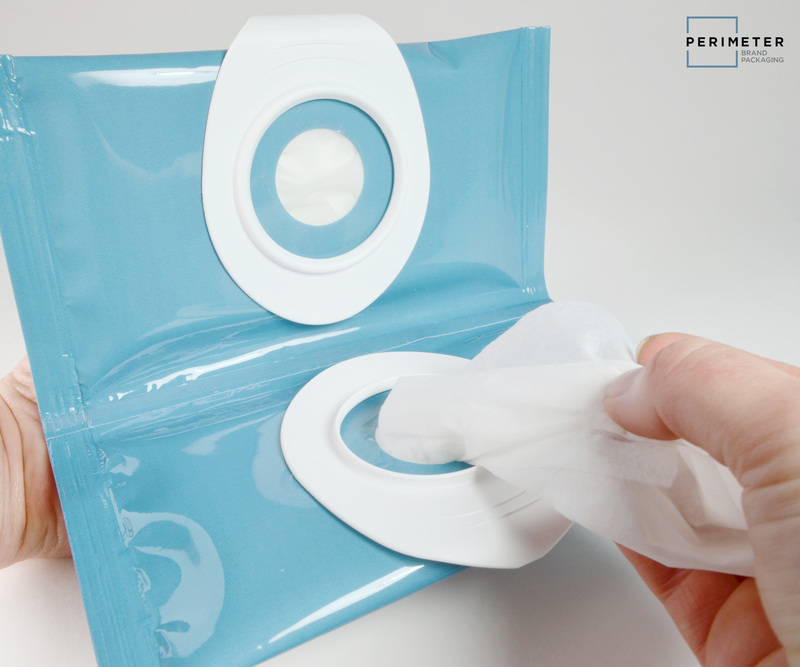 This knowledge led to Perimeter’s development of Pebble, an on-the-go beauty wipes dispenser reminiscent of the classic cosmetic case – a far cry from the diaper-association. Pebble performs in preventing dry-out and providing consumers with an audible click to reassure a tight moisture seal, but the consumer’s strong association to the makeup compact and away from a baby wipes style packaging is what made this product a success with consumers during our product testing. Many consumers use more than one type of wipe – ranging from makeup removal, skin care, personal care or anti-bacterial wipes. Some consumers who depend on wipes for washing their face see it as a two-step process. This was problematic for the study participants who relied on travel-size packs, some of which hold as little as five or seven wipes. This feedback led to the development of Webster, a dual-dispensing clutch-style wipes dispenser that opens like a book. Webster provides the option of two separate wipes that are often used together, like makeup remover and skin care wipes, in one package. While consumer insights are a key driver in unlocking new ways to packaging innovation, there are other factors that also need to be taken into account. For example, throughout our investigation of beauty wipes, we also studied current in-market solutions and on-shelf presentation at retail. We found a sea-of-packaging-sameness that magnifies the challenges communicated by consumers. Most current packaging solutions offer limited branding real estate and don’t present well at retail because they easily slouch or fall over. In addition, we noted that many current packaging solutions required a secondary piece of packaging like a cardboard container just to get the product to stand up straight. With this in mind we developed Standup. Standup is a wipes dispenser that independently stands up on shelf, eliminating the need for a secondary piece of packaging. The off-center pull allows for easier handling and dispensability and offsets that dreaded baby-wipe feel. Taking the time to connect with consumers and listen will give you crucial insight to the consumer’s relationship with packaging. By speaking to beauty wipe users, Perimeter was able to delve into more commonly known issues, like consistent dry-out and non-portable solutions, but also learn about subtle nuances of consumer habits, like the perception of baby-wipes packaging and usability challenges like doubling up on wipes. If you listen carefully to consumers, you will find all the information you need to know to create innovative packaging. With the market and interest in beauty wipes consistently growing, it’s only a matter of time before one brand pulls ahead of the rest through packaging innovation. With over 25 years of experience in product design and innovation leadership, Steve brings valuable strategic insight to the new product development challenges facing the CPG brand packaging marketplace. 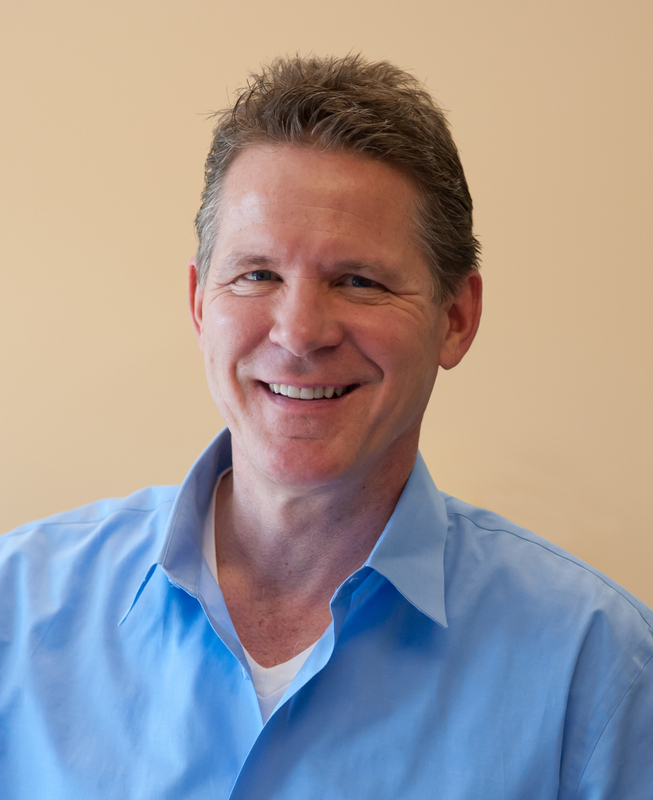 Steve is the President of Perimeter Brand Packaging and a frequent speaker at leading industry conferences and a published writer on packaging design and innovation. Prior to Perimeter, he founded and ran Radius Product Development for 15 years, an award-winning industrial design firm with locations in Boston, Chicago, Copenhagen, Hong Kong, and Beijing, until selling it in 2007.